Indonesian civil society groups have called on their government to reform its legal timber certification system, pointing to widespread illegal practices among certified companies and an auditing system that is “almost impossible” for companies to fail. The Anti Forest-Mafia Coalition, a group of Indonesian NGOs dedicated to improving forest governance, found evidence that companies certified under the country’s Timber Legality Assurance System (SVLK) had illegally cleared natural forests inside the habitats of protected species, in deep peat areas and even in forests zoned for conservation. The group also found that several certified companies had been named as suspects for intentionally starting fires in their concessions in violation of Indonesian law. Another 12 certified forest concessions were directly linked to government officials sentenced for corrupt practices in issuing licenses, an issue the group said SVLK fails to address as the audits do not look at whether or not licenses were issued legally or whether company officials engaged in corruption in obtaining permits. The findings were published in a 63-page assessment of SVLK released by the group on March 18 – just weeks after lawmakers in the European Union ratified a voluntary partnership agreement (VPA) between Indonesia and the EU that aims to facilitate trade in legal timber products. Pile of logs in Java. Photo by Rhett A. Butler. SVLK is a key part of the agreement, which was signed in September last year and unanimously ratified by the EU Parliament on February 28. When the VPA is fully implemented, SVLK-certified products will also be deemed “legal” for import into the EU, meaning companies wishing to import certified products will no longer have to conduct additional due diligence to ensure they were produced legally. The report raised concerns that the system – at least in its current form – is not sufficient to guarantee that certified timber products meet EU trade requirements. “The investigation we conducted for about six months has provided undeniable facts that SVLK certification does not ensure that timber from illegal and unsustainable harvesting is not exported to the European Union,” said Nursamsu of WWF-Indonesia, a member of the coalition. In addition to violations by certified companies, the report also found fundamental flaws in the SVLK system itself. The NGOs said SVLK criteria address some of the relevant Indonesia laws and regulations but ignore others – such as laws prohibiting corruption. In particular, the report highlights SVLK’s failure to address human rights concerns, including land tenure issues. 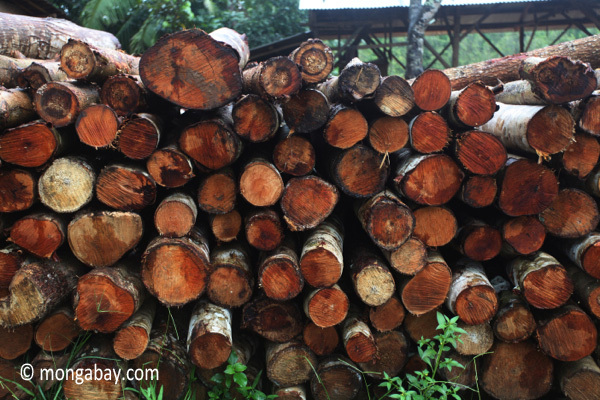 While the agreement with the EU requires that Indonesian timber products respect “legal tenure rights or rights to use land and resources that may be affected by timber harvesting,” current SVLK criteria do not address tenure. By ignoring tenure issues, and human rights concerns more broadly, the SVLK system has allowed companies in the midst of serious land conflicts to become certified. The report even examined two cases in which community members were killed, or suspected of being killed, in conflicts with companies who were later granted SVLK certificates despite these incidents and ongoing conflicts. Another major gap in SVLK, according to the report, is the lack of chain of custody verification. Mills that have been certified under SVLK, for instance, are not required to source timber exclusively from SVLK-certified timber concessions. So a certified mill could use illegal timber to produce what would still be considered a “legal” final product, the report said. 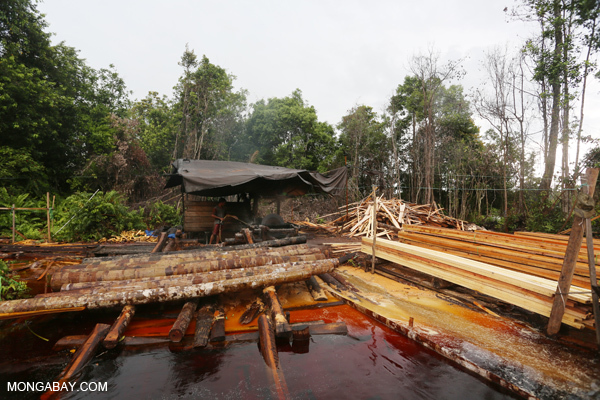 Illegal sawmill in Indonesian Borneo. Photo by Rhett A. Butler. The assessment also raised concerns that partially certified companies could essentially launder products from uncertified parts of their operations through their certified concessions, allowing illegal products to be exported. While the report highlighted what NGOs consider to be serious shortcomings in the way SVLK is currently being implemented, it remained optimistic that the system could be reformed – despite previous revisions to the regulations that groups involved in the study said have weakened SVLK standards. First, the report said the definitions of “timber legality” and the audit criteria need to be changed, as well as the grading system, which the report said was weakened when a rating of “fair” was introduced to the previous pass-fail system, making it much more difficult for companies to fail audits. Existing certificates should also be reviewed and a chain of custody system adopted that would require companies making certified products to source materials exclusively from certified operations. The report also calls for improved transparency and said that civil society groups, which are supposed have an official “watchdog” role, be “given access to every step in the process” – something NGOs say is currently being restricted.